Three weeks into October and it’s much of the same. Sales continue to fall and listings are piling up. It appears clear as day the market is correcting even the CEO of Royal Lepage was quoted as saying “Vancouver prices have seen their last hurrah.” That’s a pretty bold statement from someone in the real estate industry. I’m still in awe when the keyboard warriors come out and attack my blog. Just today a nice man from the Eastside of Vancouver commented “yea but the prices are still rising. Sleazy spin on the stats.” He was referring to my post Detached Sales 46% Below 10 Year Average. Pray for him. Anyways, i’m sure this nice man won’t like what I have to say today. The October sales to actives ratio (a measurement of demand) is down again this month. I highlight this stat all the time, most recently in the September Detached Market Report and the September Condo/Townhouse Market Report. Demand has fallen every month since March in the detached market, and in June the condo/townhouse market followed. Yep, every single one of these markets is now classified as a buyers market (anything under 14%). 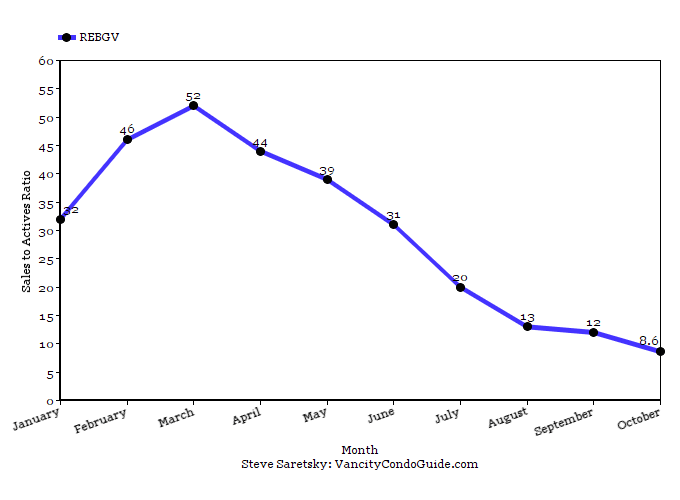 REBGV detached market now has 11.6 months worth of inventory. The condo market is still a sellers market as it is above 20%. However, it’s been on a slippery slope down. 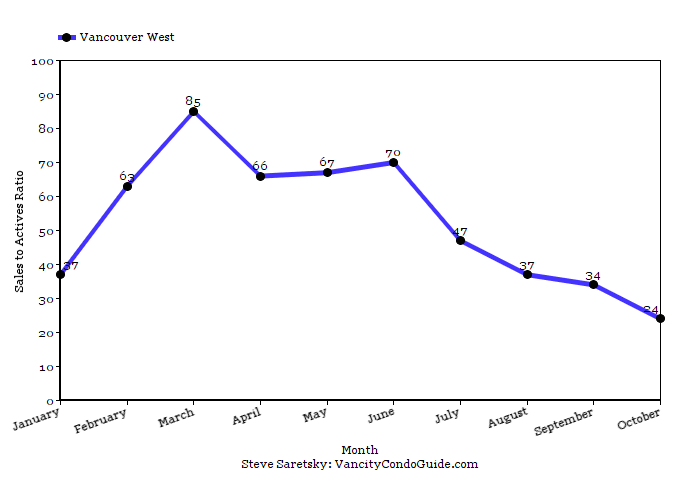 For example, Vancouver West was once at 85% in March. In my September condo/townhouse Market Report I said townhouses across Metro Vancouver would hit a balanced market within 2 months. It appears Vancouver West is already there at 17% and 5.85 months worth of inventory. At this rate you should expect other areas to be there by November. 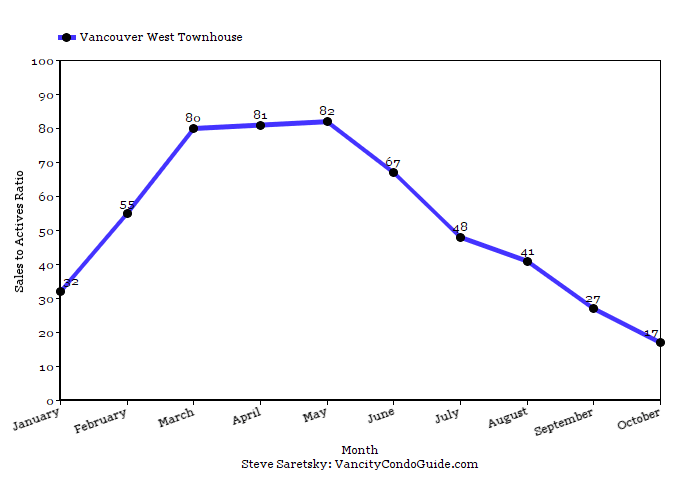 There’s only been 20 townhouse sales this month in Vancouver West. Yet almost half of them have ended up selling over asking price. It begs the question: who the hell is buying these places? I’m convinced the market is now being driven completely by young millennials just itching to get into the market at whatever cost. This is even more evident in the cheap areas such as New Westminster and Langley where condo sales remain red hot. I promise you little Johnny won’t be priced out forever if he doesn’t buy today. Demand continues to drop. The detached market clearly favours the buyer and will almost surely be the same for the condo/townhouse market in the coming months. It seems like an absolute certainty that the new lending policies will slow the market further. But then again even the Bank of Canada Governor Stephen Poloz isn’t entirely sure at this point. When asked if the new policies would slow down housing sales he said “It’s a highly uncertain figure … our best guess is that it will slow down housing resales, but it may not. The impact could be bigger but it could also be smaller.” Wonderful, whatever that means. Hold on tight.